I love gift giving! It’s one of my top two love languages. I also love my son’s teachers. I have a special place in my heart for teachers obviously. I decided to go with a basket gift filled with dinner and a little goodie. Here is a gift idea for a teacher, but would also work for a neighbor or friend. My mom makes a really good Tamale Soup. 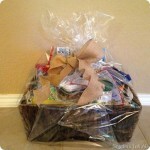 It’s super easy and great for a basket gift. I included all the ingredients (recipe below), along with the original recipe, directions, and a box of cornbread. I also added a mug with a Starbucks gift card inside. I found these baskets at Walmart for about $5. I love the chalkboard label on the front. I was going to write their name on it, but forgot to get chalk or a chalk pen (can’t believe we don’t have chalk). Then I wrapped it in cellophane and tied a ribbon around it. I included only one can of each to half the recipe (they can still use an entire taco seasoning packet). I rinse the beans, hominy, and corn (my mom doesn’t so it’s up to you). 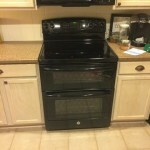 Then combine all the ingredients and cook on the stove for 20-30 minutes. I like to top mine with cheese and make some cornbread to go with it. The details of the basket: I stuffed the bottom with grocery sacks, then topped it with white tissue paper, and added some of that shredded Christmas paper on top. Then I placed the items on top in a decorative manner. Wrapped it up and it’s good to go! In each cup, I added some candy to surround the gift card. Another good recipe to include in a basket would be this taco soup recipe (could just add the dry and canned ingredients) and include the recipe with it. They only have to add water, onion, and ground beef. Next up is how to dress up a gift card. I’m not a big gift card giver, but sometimes it really is the best gift for someone. I cannot just hand over an envelope with a gift card, so I thought I’d stuff it in a mason jar with candy. Much prettier to receive, plus they can enjoy some candy instantly since their gift has to be used later. You could also add things like rolled up fuzzy socks, nail polish, gloves, etc. I used festive holiday colored Snickers and Hershey Kisses. The Snickers take up a lot of room so you’re not using as many Hersey Kisses. Candy can get pricey so this is a good way to make it look fuller. For my bigger jars, I placed a few Snickers on the bottom, then the gift card on top and filled the rest with Kisses. For the smaller jars, I put the card in first and filled the rest with the combo candy. I also added these circle stickers to the top of the jar. 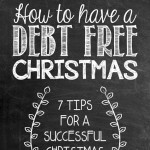 You could also add a tag with the person’s name, “Merry Christmas,” or “From: Your Name.” Tie some ribbon with the tag attached and you’ve dressed it up even more. 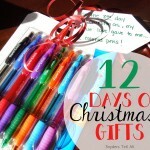 HERE is another teacher gift idea I did for the beginning of the year last year, but would certainly work as a Christmas or birthday gift for your child’s teacher. 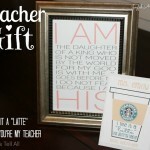 Do you have any good teacher gift ideas or ways to dress up a plain gift? I’m off to bake 20+ “cakes in a jar” for my husband’s co-workers! I bake for them all the time, so this will be a little fancier version of a goodie. I’ll share the recipe and method soon. 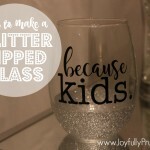 For my daughter's daycare teachers I am putting a giftcard in an acrylic lidded tumbler and adding some Crystal Light packets. Great idea Tiff! I know I'd love that since I love Crystal Light. I saw some monogrammed tumblers at Bed Bath and Beyond. Wow!! These are such great ideas and I love how beautifully you packaged everything. I am a teacher and I would LOVE to get one of those gift baskets! My favorite types of gifts to receive from my students are anything food related and any stationary/paper products. Decorative things not as much because you start to accumulate so many over the years, although I truly am grateful for any gifts I receive! Thanks Jen! That's a good idea to give to new moms. It's so easy to put together and they can make it when they want. Sometimes you're overloaded with dinners and can't eat them fast enough, so this could be an easy thing to have when you don't have dinner.